Companies continue to rise to the occasion of responding to proposals. Why? To win new business, naturally. 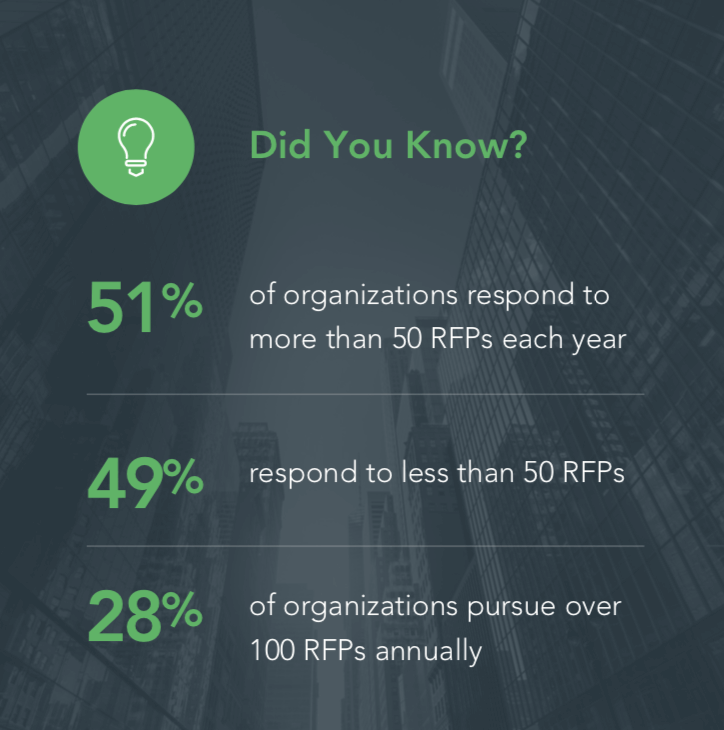 Half of these organizations respond to more than 50 RFPs every year, with 28% of that total managing over 100 RFP response projects. Still, many teams don’t understand how to respond to an RFP well. They’re going through the motions, rather than maximizing each opportunity. Responding to RFPs takes time and resources. The best way to make sure that effort is worth it is to learn ways to improve how you manage and execute RFP responses. Check out these steps and best practices, so you can learn how to respond to an RFP like the pros do. What is a Response to an RFP? You’ve probably responded to plenty of RFPs. But, do you know why it matters so much? A response to an RFP (request for proposal) is an answer a vendor provides to a question which has been issued by a prospect. 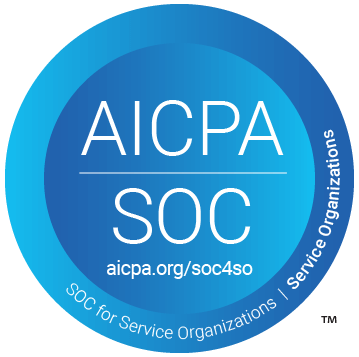 The issuer evaluates the set of RFP responses to decide if the vendor is the right partner for their organization. How an RFP responder answers these questions can mean the difference between landing a deal or losing the deal to a competitor. Even if you have the best product or service on the market, you still have to demonstrate value during the RFP response process. All RFP responses are not created equal. Rather than recycling boilerplate content, each response should be tailored to the prospect you want to win over. The quality of your RFP responses definitely matters—whether you are crafting an executive summary, revealing competitive differentiators, or discussing your company’s approach. Make sure you know the nuances of different questions and sections to produce an RFP deliverable that wows the issuer. If you don’t wow the issuer, someone else will. Even though teams are working with high volumes of RFPs on an annual basis, the majority struggle with how to respond effectively. RFP response is a common source of confusion. These steps will help you feel more confident about how to respond to an RFP. Assign due dates and tasks to SMEs. Review and revise RFP responses. At the very least, following these basic steps of responding to a request for a proposal will provide clarity for your proposal management team. Once you have these steps down, we recommend stepping up your RFP game. Determining roles and responsibilities at each phase of an RFP project are a must for ultimate efficiency. Building a one-sheet strategy will set a strong RFP management foundation for you and your team to work with. For a more in-depth RFP response process example, you can find that right here. 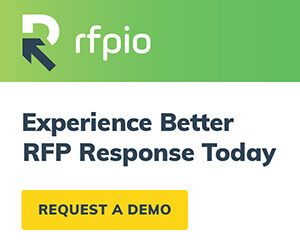 Now that you’re feeling good about how to respond to an RFP, it’s time to leapfrog into some best practices for responding to RFPs. It all comes down to the P-word…process. Don’t just have an RFP response process—have a great one. You might be wondering what that looks like, because you haven’t thought of creating a definitive process for responding to RFPs. Or, you might sorta-kinda have a process for responding to proposals that isn’t working at your organization. The most effective responders think beyond rushing through an RFP project for the sake of checking something off their list. They leverage teamwork and technology to create strong RFP responses in less time. Embrace Teamwork – Exceptional teamwork should happen with every RFP project. If your team or certain departments are working in glaringly obvious silos, it’s time to come together as a unit to create better RFP responses. Period. Communicate Clearly – Communication must be clear and easy for all contributors to avoid confusion. When SMEs stop contributing their expertise to RFPs, it’s a big red sign that they are frustrated or fuzzy about something. Document Processes – A documented RFP response process will anchor your team during the most chaotic times. In case nobody owns the RFP process—which is quite common—consider being the person who owns the strategy to make life better. Organize Content – Content needs to be easily accessible in an answer library for any team member. SMEs struggling to find content will spend time they don’t have that could be better spent on fine-tuning a previous RFP response. Ensure Quality – An answer library should always be relevant to ensure quality. Spreadsheets, emails, and online folders that “store” historic responses are not the way. RFP software has an answer library built-in…this is the way. Work Efficiently – There is time to spare before the deadline when an RFP response process and technology are routine. Otherwise, RFP contributors end up working after hours and weekends, rushing to meet deadlines. RFP responses suffer as a result. Be Consistent – Branding and messaging must be on point every time—no matter how many SMEs, voices, and personalities are involved. A surefire way to compromise an RFP deliverable? With inconsistent fonts and language that look unprofessional. When you follow these best practices for responding to RFPs, you increase your chances for winning the next big deal. Even putting a few of them into action will improve the way your organization is managing RFP projects. If you’re one of many organizations responding to 50 plus RFPs annually, go ahead and hit that pause button. Take a breather to understand how to respond to an RFP well. It will bring you one step closer to building a more enjoyable RFP experience. And, you’ll achieve greater successes together when everyone is happier and more productive. Ready to respond to RFPs like a seasoned pro? Nice! Find out how RFPIO makes your process easier.